Twelve-year-old Aijez had never set foot inside a school. He and his family lived in the slums. His father, Mukil, earned a living as a daily laborer, while Aijez and his siblings worked at a tire shop for additional income. Because the young boy worked to support his family, Aijez had no opportunity to attend school. Every day as he worked at the tire shop, he saw other children walking to school. All he could do was watch, unable to join them. Aijez, like many slum children, was caught in the vicious cycle of utter poverty. Because he could not go to school, his future held nothing but continued impoverishment. Day after day it stayed the same—toiling at the tire shop—and would have continued this way. However, some Sisters of Compassion, Gena and Meriel, started serving in his area. 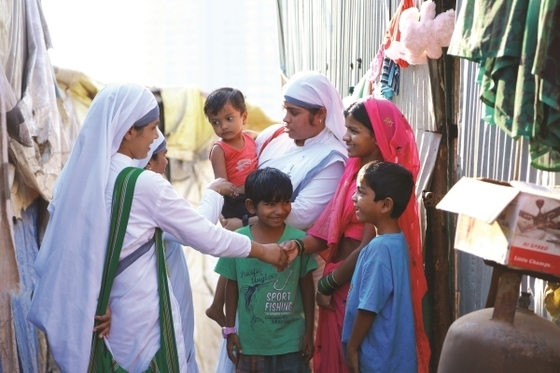 Surveying the slum, these sisters saw a very real need. Gena and Meriel watched many children sitting and playing in the mud. They saw the destitution and hopelessness in their eyes. So these women went out, spreading word that they were holding literacy classes. At first, only a few families sent their children to the classes, unsure of the sisters’ intentions. But as trust was built over time, more and more children and mothers began to attend. But trust had not yet been established in Aijez’s family. Aijez watched the children attend the classes, and he wished he could join them. One day, Aijez came across Gena and Meriel. When the sisters saw this dirty, unkempt boy, they saw something beyond his poverty; they saw his deep desire to learn. The sisters invited him to the literacy classes. Aijez secretly began to attend the evening classes after his daily labor work. He knew his father, Mukil, wouldn’t approve, but Aijez yearned to learn. Every night, with pencil in hand, the eager boy began his education. Aijez soaked up everything the sisters taught. After some days, Gena and Meriel, not wanting to go behind Mukil’s back, approached the man. They showed him Aijez’s desire to learn and asked him to send Aijez to the classes full-time. By the grace of God, Mukil agreed. When Aijez heard that he would attend the classes with his father’s blessing, he rejoiced and thanked the sisters wholeheartedly. Sisters of Compassion, like the ones who taught Aijez, are sharing hope in slums by practically supporting families in need. Aijez worked hard, both at class and at the tire shop. He knew this was an opportunity he could not waste. Seeing Aijez’s diligence in his studies, Mukil let Aijez’s mother and sister attend the classes as well. In the span of six months, Aijez learned the alphabet both in his dialect and English; and is able to write and read numbers, too! Aijez can now attend a real school. No longer does he work at the tire shop but attends school full-time. 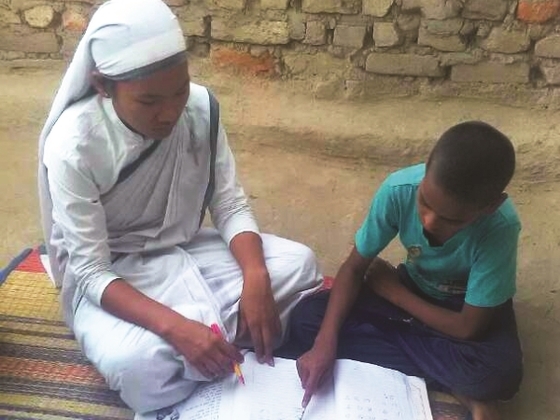 After school, he still goes to the literacy class, soaking up the love and encouragement from the Sisters of Compassion. Because God sent Sisters of Compassion to his community, Aijez (pictured) can now read and write. Now, the mud and dirt are no longer Aijez’s future. He and his family can look to something higher than the ground around them. 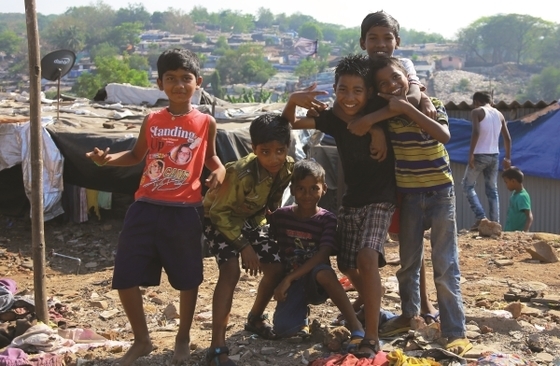 For them, the cycle of poverty is breaking. Stories like Aijez’s are only possible because of donors and sponsors like you. Because of you, there are many families who will experience similar changes, through God’s ministers. Thank you, and God bless you!